State prosecutors informed the Supreme Court the government plans to investigate illegal building in Shilo even as it plans to legalize it. State prosecutors on Thursday informed the Supreme Court on Thursday they would open a probe into "illegal construction" in Shilo. Previously, the left-wing Peace Now organization had filed a petition with the Supreme Court demanding the government open a criminal probe into illegal construction in and around the Shilo. 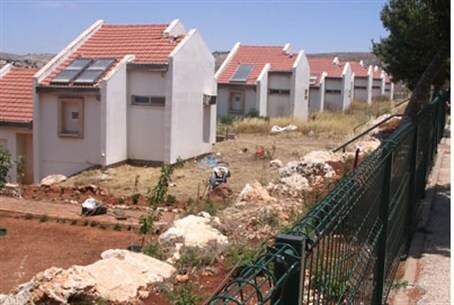 Three neighborhoods in Shilo, as well as Shvut Rachel, were built with government assistance despite the lack of formal permits from the Defense Ministry. The government initially responded that, in light of plans to legalize the neighborhoods, they had yet to decide if they would open an investigation. The Supreme Court, dissatisfied, asked the government to give a "clear response." Following consultations with Attorney General Yehuda Weinstein and the head of the Israel Police criminal investigation division, state prosecutors decided to open a criminal probe. However, prosecutors also informed the Supreme Court that the government planned to simultaneously move forward with plans to legalize the very structures whose "illegal" construction they are now investigating. The IDF Civil Administration's High Planning Council for Judea and Samaria has already publicized plans to retroactively authorize Shvut Rachel, and two other disputed neighborhoods. Plans to normalize the third are expected to be publicized in the near future, when they are complete. A legal source close to the case who spoke to Arutz Sheva on condition of anonymity said the state prosecutor’s decision appeared to be designed to put an end to the case. "If the government said no, they aren't investigating, the court would have to decide whether that was reasonable," the source explained. "Saying yes means the court closes the file. Its not the court's job to follow up on the results of the investigation." "By the time they are done investigating, these communities will already be fully legal. At that point, there won't be any point in prosecuting anyone," he added.